This is from my last trip to Park lake I loved how it stood right in front of the lake. Autumn may mean that the cold is on the way but lately I have actually beagan to look into it's beauty too. 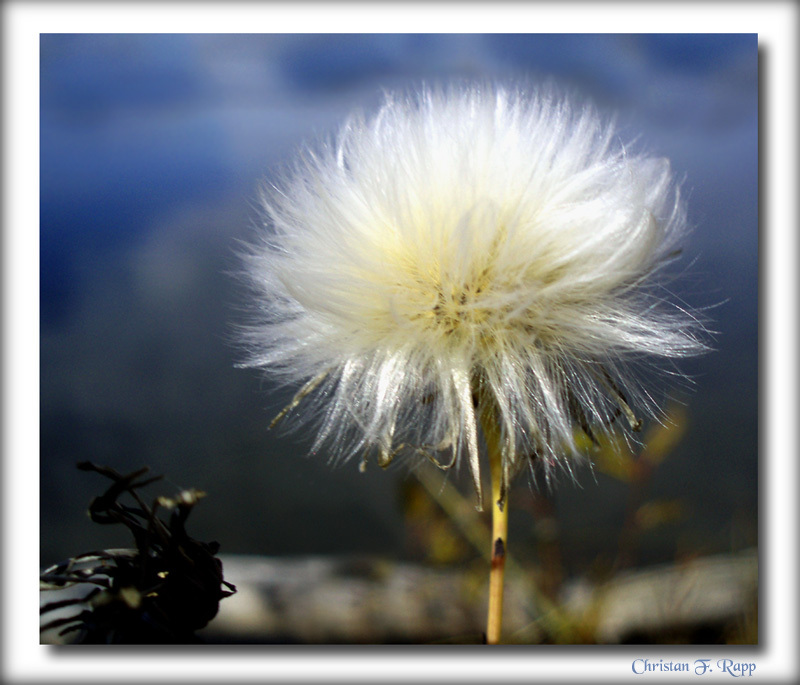 Yes colorful bright flowers are gorgeous but without this white fur ball of seeds the colors of spring wouldn't be. I hope you all enjoy!! Lovely light and attractive colours! This bundle of seeds is well captured and presented in a well balanced composition! One of your best if not the best. You have captured the aura! Need I say more!? Hello Christan, very good macro of that beautiful flower, lots of details in this well composed image. Well done ! tres jolie pr�sentation de cette fleur, belles couleurs et nettet� parfaite. Belle et int�ressante composition photographique pour cette Jolie fleur tout en graine. Tr�s jolies couleurs et bonne nettet�. Excellent exposure/color and well composed. You are right. It is truely BEAUTIFUL. Friendly greetings from Calgary from Mario. Such a beautiful image. I love the fluffy bud. Composition is great and DOF amazing. The only nitpic is the dark contrasty bud in the shadow on the bottom left corner kind of a distraction.